I have been sick for the past couple weeks, really bad this past week and while I'm on some antibiotics it's just not totally fixing me - sinus issues - they've been getting worse each year; gotta just love the south for that. Anyways, I'm ready for warm weather; may not help my sinuses but I don't care; I'm tired of the cold and I just want some warmth. 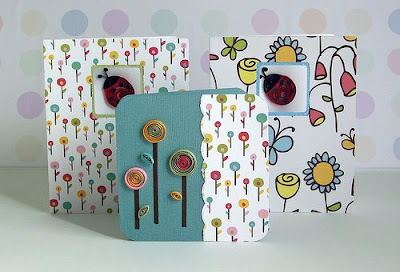 These cards are inspired by the warm weather and I love them all. I found these awesome papers from American Crafts; their Craft Fair line by Sophia Tuckett - I believe she did both. 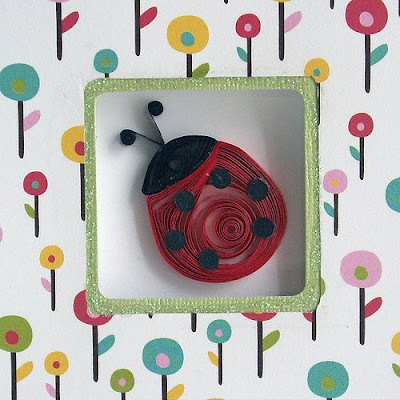 They were bright, fun and whimsical and I knew I had to buy them and also knew right away I was going to use them with some quilled ladybug's - I'm so happy with the way they turned out. The green window card is in my etsy shop and the blue window card is on sale here in town. The smaller card was a freebie from a shop on etsy, cute little card with it's rounded corners. I was pleased it matched the colors in the poppies paper so I used that to place on the side and then mimicked the poppies by quilling them and placing them on the left side of the card - I have decided I like this card so much I can't part with it so I keep it in front of my work area and look at it every now and then. To see more views of these cards please feel free to check out my photostream on flickr. Here's to spring! 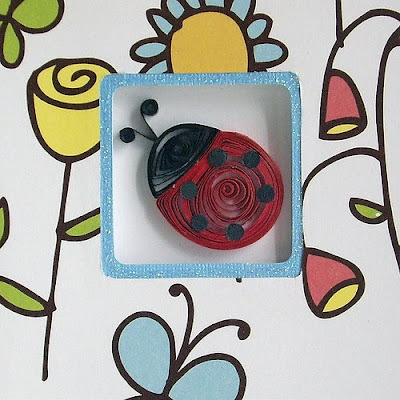 Such a cute ladybug1 and I love the little lollipop flowers..lovely quilling!